In my previous post, Correctly Prepping Your Tucson Home for Paint Does Affect the Price I shared with you the importance of have your Tucson home prepped correctly prior to paint. Okay, now that your home has been professionally prepped. 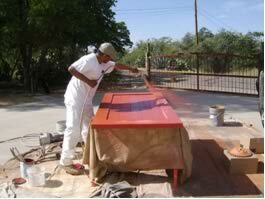 We’re going to share the importance of understanding the next steps in having your Tucson home Professionally Painted. Finally it’s Time to Paint! Many Homeowners ask how we are going to apply the paint. This will vary depending on the application. After all the reason you’re painting the exterior of your Tucson home is to weather proof it. So, how the paint is applied is very important. Of course prior to painting your home we always cover or mask the areas that are not being painted to make sure they are protected. If we are painting stucco we will employ a method called back rolling. This means we will spray the first coat heavier than usual and follow behind with a roller, this allows the nap of the roller to get the paint into all the angles of the stucco, we then follow behind again and spray a top coat. This method will ensure we get the required film thickness and that we are doing all we can to weather proof your home. On the exterior of your home there can be various wood surfaces, first let’s discuss wood siding. We would employ the same basic technique on wood siding that we used on the stucco. We want build a heavy paint film to protect the wood from the beating it will take in the summer. Back rolling will help to do that.Since the eves of your home don’t get direct sunlight we can spray 2 even coats of paint to that surface and we have the protection we need. Now let’s talk about the fascia (the wood that goes around your house along the roof line). The fascia takes such a beating with the Tucson summers and monsoons we definitely want to pay attention to how we apply the paint there. I believe 2 coats of paint at a minimum should be hand applied to the fascia. This allows the bristles of the brush or the nap of the roller to fill the texture of the wood with a heavy paint film helping to ensure the wood is protected from the elements. This covers the different application methods that should be used for the different surface types on the exterior of your Tucson home. Next we will discuss paint and the importance of using the right paint for these applications.